Uses a proven process-oriented approach to drive successful organizational change. 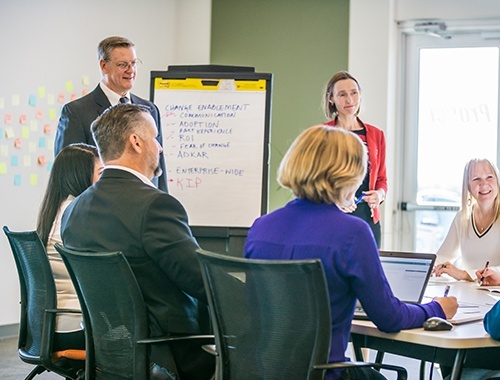 Since the Prosci ADKAR Model was developed two decades ago, thousands of change leaders have applied it to their change initiatives to improve project outcomes. The ADKAR Model distills the change process into the most basic yet critical elements, making it easy to use. Yet it’s a multipurpose, multifaceted tool that has the power to impact how you lead change and how individuals experience change in your organization. Fundamental to the ADKAR Model is this: Change occurs as a process, not an event. And it can be difficult and complex to understand. Breaking down change into distinct elements helps us understand the process of change and how to manage it. The theory of three distinct phases of change has roots in works from anthropologist Arnold Van Gennep in 1909 to Kurt Lewin in 1948 and William Bridges in 1980. The three states of change—current state, transition state, and future state—provide a powerful framework for the process-oriented approach of the ADKAR Model. The model clearly establishes how an individual moves through the change process, from their current state to their future state, and provides the insight needed for successful organizational change. To move out of the current state, an individual needs awareness of the need for change and a desire to participate in and support the change. Successfully moving through the transition state requires knowledge on how to change and the ability to implement the required skills and behaviors. In the future state, individuals need ability and reinforcement to sustain the change. The ADKAR Model is an outcome-oriented model, describing the milestones an individual must hit to successfully adapt to change. These milestones guide the development of change management plans. You can use an ADKAR Model assessment to identify the barrier point of any individual impacted by a change. Once you understand this and the root cause of their inability to change, you can develop a strategy for helping the individual move through the change. Simply measuring change management activities doesn’t tell you if your approach is achieving intended effects. Since the ADKAR Model establishes the elements required for a successful change, you can use it as a measuring stick to evaluate the impact of your change management activities. The ADKAR Model provides a helpful framework for discussing change. Leaders can use it to direct conversations in a productive way. And employees can use the model to identify why they may be struggling with a particular change. A common language makes difficult conversations more outcome-oriented. Achieving results requires more than just “finishing the project.” The ADKAR Model focuses on adoption and usage, which supports project execution and drives benefit realization. Giving leaders the ADKAR Model framework allows them to pinpoint where their employees are in the change process, so they can coach each employee based on their unique progression and barrier points. Teaching managers the Prosci ADKAR Model helps great leaders become great leaders of change. We asked over 400 change professionals how they use the ADKAR Model. 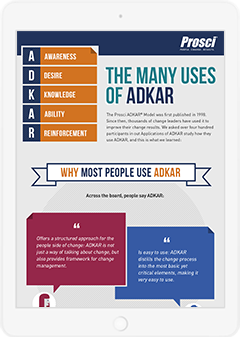 Check out the infographic overview of our Applications of ADKAR study to dig deeper into what they said and identify the ways you can apply the ADKAR Model in your organization. Ready to start applying the ADKAR Model?